Children and cats can be a great combination or a recipe for disaster. 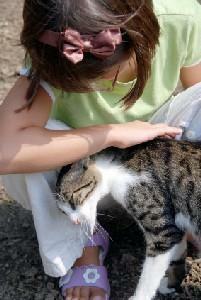 Find out steps to take to help your feline and human kids live in peace and harmony. I have a black cat that is fifteen months old. He's always been very loving and sweet. He has recently started biting my seven-year-old son. He stalks him into his bedroom and then attacks. We've been putting the cat in his kennel when it happens, but I can't figure out why he would suddenly start biting my son. The cat, Romeo, seems to love Alex. The cat wants to play and loves to kiss, but in the last day he has bitten him every chance he's gotten. What do I? I don't want to get rid of my cat. I love him to pieces, but it's obviously not acceptable for him to bite my child. Please help! I truly understand your concern. I have two daughters and it's upsetting when your pets and children don't get along because those pets are like our furry children. While Romeo's behavior is a little strange, cats do give out love bites to show affection. Is it possible that Alex is petting the cat and the cat is getting over-stimulated and giving out these affectionate or playful bites? Because cats have tougher skin than humans, they don't really understand that their bites hurt. There are a few things you can do to try to stop Romeo from biting, but you'll have to enlist Alex's help as well. It's possible the cat is not getting enough play time and the bites are a form of play. Fishing pole toys can be great for kids and cats to play. The child will be at a safe distance and the cat still gets pounce time. The play time should occur every day for about fifteen to twenty minutes, three times a day. You and Alex could take turns playing with Romeo, for example. Teach Alex to not pull away when Romeo does bite. Prey pulls away when a cat bites and the cat's instinct is to not only bite harder, but to dig in his claws to hold on tightly to the prey. By keeping his body still, Alex can prevent what might be an affectionate or playful bit into turning into something harder and more painful. Pay attention to the cat to see if he is getting too excited while being petted. Signs include a twitching tail and ears laid flat. Note how long you can pet him before he reacts in this way and teach Alex to look for the signs and stop petting when the cat displays these signs. For example, if Romeo starts to grow irritated after five minutes of petting, then you and Alex should stop petting at three minutes. Most of all be patient. I understand your concern, but it's unlikely that as long as Romeo has had all of his shots that he would do any serious damage to a grade school child. More than likely, this is an affectionate and playful phase he is going through and once you increase his play time the cat will stop the biting behavior.